University of Houston-Victoria students take a break from volunteer work March 20 near Camp Wilkes in Biloxi, Miss. 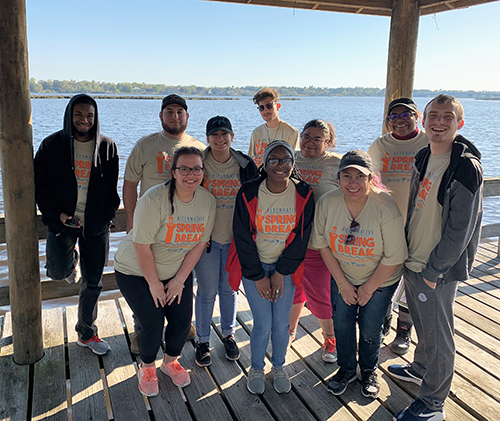 Ten students took part in the university’s Alternative Spring Break volunteering trip from March 17 to 22. During the trip, students worked with Community Collaborations International to volunteer in soup kitchens, and help with environmental and house restoration projects. Pictured in front from the left are Victoria Proctor, Abrisha Spencer, Jocelyne Martinez and Vladyslov Shapoval. In the back row are Zion Walker, left, Vito Lozano, Shelbie Ayala, David Illingworth, Drea Rodriguez and Kiyanna Coleman.